Mark Carney did his best yesterday to justify the decision of keeping interest rates at 0.5% at the same time that it was promising that the economic momentum will be regained and that interest rates will have to rise soon. Unfortunately, this is not new. Since March 5th, 2009 (more than nine years ago), when interest rates were lowered to 0.5% in the UK, we have not seen much action despite all the talk and promises of higher interest rates. 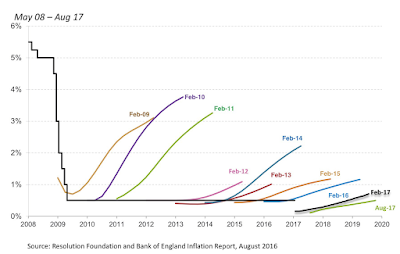 And inaction of interest rates has mostly come as a surprise as projections on interest rates were always much higher than what was later delivered by the central bank (see image below). 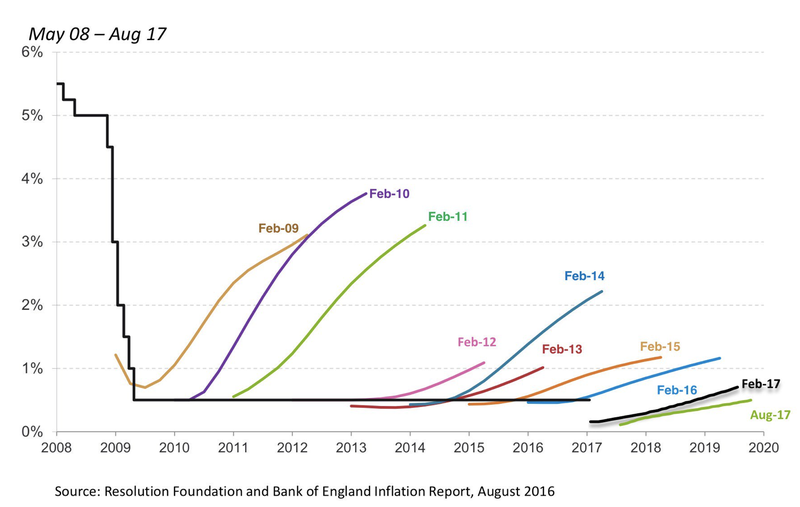 What we are seeing in the UK is not different from what we have seen in the US after the Federal Reserve stopped quantitative easing and engaged in a slow path of increasing interest rates. So far there have only been surprises on one direction: the Federal Reserve ended up postponing an interest rate increase that was anticipated by the market. And the ECB or the Bank of Japan are still far to get to the point of talking about higher interest rates but when they do, they are likely to face the same issues. Either central banks are setting the wrong market expectations or they are being themselves as surprised as everyone else by the slow pace of economic growth and wage and price inflation. Regardless of the reason, this is a reminder that the last 9 years have not been normal for monetary policy. That we have learned that getting out of a low inflation environment is much harder than what we thought. And let's not forget (if history is an indication) that one of these days we will have another global crisis and interest rates will have to come down (from 0.5%?) and we will start all over again, hoping to get out within the next 10 years. Will interest rates be clearly above zero in these markets 10 years from now? Chances are that they will not be. And given all these lessons and persistence of low interest rates you would think that we would have spent some time thinking about how to avoid falling into similar situations in the future. Unfortunately we have not. The most obvious solution is to raise the inflation target so that we all move away from 0%, but that is clearly not an option in any of these countries. I do not like the expression "the new normal" because it is applied too often even when nothing has really changed but in this case there is no doubt that 10 years ago monetary policy entered the new normal and we are not sure when we will get out of it.